Everyone labelled Karnataka assembly election as ‘semi-final’, a decisive indicator for upcoming national elections next year. If that’s the case, does it mean that despite emerging as the single largest party in 2019, BJP will fall short of the requisite numbers to form a government? The ‘opportunist’, but united, opposition will make a bid to form government. However, with most number of seats under its belt, BJP may get the President’s nod; will be asked to prove its majority on the floor of the house within 15 days. Opposition parties will cry foul, and scurry to the Supreme Court. The court may disallow 15-day period for proving majority, instead directing BJP to prove its majority with 24 hours. And then … will it be a repeat of Karnataka, forcing Mr. Modi to resign before the trust-vote, but only after delivering an impassioned speech on the floor of the house? Or will there be a twist in the story, with BJP managing to win enough horses to ride? We cannot predict the 2019 result on the basis of a semi-final, else why even play the final? However, simple analysis indicates that final may pan not very differently from the semi-final. In my earlier blog on April 2, 2018 (Why is India’s greatest salesman failing? ), I had attributed BJP victories in state after state that went to poll over the past four years, to a phenomenal called Modi ke laddo. Mr. Modi, with his exceptional oratory and leadership skills, and a strong image of someone who is always guided by the larger good for the country – swatchhta, digitalisation, corruption, India’s place in the world, gas connections for poor, even his concern for students appearing for exams – is like an eligible groom everyone wants to marry (vote for, that is). Why ladoo? A marriage is like a laddo, either way one regrets tasting it, whether one chooses to marry or stay single. As more people marry than who don’t, it’s obvious we like the idea of tasting ladoo. That’s exactly what the people of India chose since Mr. Modi emerged as front-runner for the coveted PM position – taste Modi ke ladoo. Every non-BJP governed State that went to poll in since 2013 has voted for Mr. Modi. But those that already had a BJP government, showed less enthusiasm – throwing BJP out in Punjab, giving more seats and votes to the opposition (Congress) in Goa and Meghalaya, and reprimanding the party in Gujarat. Karnataka had yet to taste Modi ke ladoo. It couldn’t resist, much like everyone else, rewarding BJP with most number of seats in recently concluded election. Yet, leaving it out of breath, just short of a simple majority. Obviously, the word had spread that the ladoo doesn’t taste as promised, so far fewer people opted for it than was the case in States that went to poll earlier. (Analysis suggests that Mr. Modi’s magic helped the party swing about 3% additional votes in its favor, but still not enough to surge ahead of Congress in overall votes, managing barely 36% votes against Congress’s 38%). I believe had Karnataka elections been held a year earlier, BJP may have romped home with 150 seats, if not more. (Mr. Shah’s prediction of 150 seats came in a tad late, looks like). One, in 2014 Lok Sabha elections, BJP polled 43% votes in Karnataka, 23% more than the 20% it polled in the State election the previous year. Undoubtedly, a huge swing in favor of Mr. Modi! In the just concluded election, however, its vote share is 7% lower than 2014. 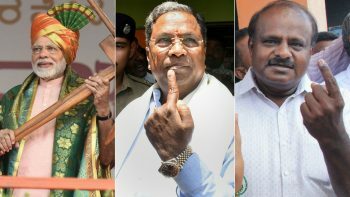 That is dismal when you consider anti-incumbency – no government has ever been voted back to power in Karnataka since 1985. And the fact BJP contests all State elections like national elections – Modi vs. the rest. Two, when BJP lost in 2013, it barely managed 40 seats, with JD(S) also taking 40. In the current elections, despite losing to BJP, Congress managed 78 (nearly twice), while JD(S) finished marginally lower at 37. So, Congress didn’t actually lose, but BJP won the math – right number of seats at the right place, despite majority of the people choosing to vote for Congress. Clever! I believe everyone got it right: the election in Karnataka was truly a semi-final. The results confirm that both BJP’s popularity and Mr. Modi’s charisma are on a decline. The opposition is in with a great chance to beat him in the final, provided it can get its act together. Which means present to the people of India an alternative that’s realistic and credible, both at leadership level and what it promises. Hi Mukesh! Sorry, I’d missed responding to your comment. I believe Modi is a great orator. But he may be wasting his capabilities just bashing Congress. Though his content is poor most of the times, his persuasive skills are remarkable. Your view on his leadership is absolutely bang on. A great leader builds consensus and carries his team along. Neither applies to Modi. But after 10 years of moderate, soft-spoken Manmohan Singh and his ‘maun’ doing his last two years, mistakenly made Indians believe that smart sloganeering and clever oratory equals leadership. Glad all of them are gradually realizing their folly. – Oratory skill – I think it lacks substance. It is more about bashing Congress and using rhetoric like “Congress did NOTHING in 70 years”. The real test of oratory skill is when you confront a press conference and take on challenging questions with tightly argued answers backed by facts. three people who aced this skill is P Chidambaram and Kumar Vishwas. Their content is amazing. – Leadership: Real leadership is not showing people the mirage or false hope. It is about diligent follow-through on promises made. Take responsibility when failing to deliver. What Modi did best has he engaged an excellent PR and Advertising agency – who suggested using certain keywords on bashing opposition or giving hopes (“Yes we can” copy of US election). What BJP failed to recognize, that even though mass electorate is uneducated or poor, they are smart…a lot of them. Great packaging can help sell a product, but not for long.